You know the routine, especially if your are training a new puppy. Let your dog out - Let your dog in. The perfect time to develop a strong bond with your lovable dog while taking care of some necessary business. Our Dog Lover's Personalized T-Shirts are Available on our premium white 100% cottonT-shirt, machine washable in adult sizes M-3XL. Also available on Ash Gray. 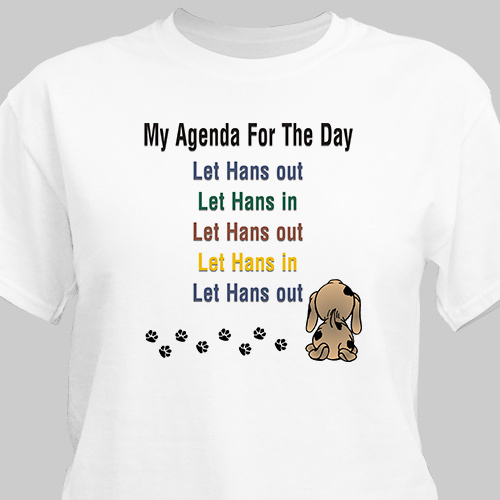 Dog lover's shirt includes FREE Personalization! Your Dog Personalized Shirt comes with any dog's name. I love this shirt, but I feel the last sentence should have been let Baxter in, my dog isn't an outside dog. Be sure to look at our entire collection of Personalized Pet Lover Gifts. We offer fabulous Personalized Pet Lover Apparel, Personalized Dog Gifts, Personalized Pet Picture Frames plus much more. Shop GiftsForYouNow.com for all your Personalized Pet Lover Gifts.